Oh how I dislike January…dark, wet and muddy…very muddy. I have to remind myself that it is the same every year, and all will be lovely again by spring. So to keep myself chipper and looking forward to sunnier times, I have started making my mating decisions for this summer. We are fortunate to have a lot of top stud males to choose from, and it could be tempting to just share out the females, but every mating decision is given a lot of thought; what pairing is going to give the best results. Okay, I will hold my hand up to occasionally going off plan in the past, when failing to get a female pregnant to the desired male, and when time is running out, but it rarely proves to be a good idea. 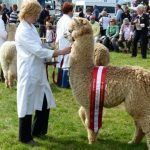 Of course the decisions involve much assessment of the fleece and conformational traits of the females to be bred, and of their progeny; dams; siblings; as well as assessment of the progeny of our males across different lines. Having a number of generations on the farm does make this easier (I can hardly believe that Explorer will be a granddaddy this year thanks to First Edition); it also helps having Craig available to assist with holding the alpacas (whilst Paul will do this I can sense the… ‘I could have built a shelter by now’… tension after looking at more that a couple!!) Craig is very keen to learn and this is all valuable experience…assess, assess and assess!!! As no perfect stud male exists (luckily as that would be game over) it is often about adding a bit of this, then taking out a bit of that. It’s like cooking without a recipe; then tasting to see what improvements can be made. Layering up the positive traits and taking out the less desirable. Of course this takes many years, and so I believe that the impact of a male within your herd, can really only be judged over time. This got me thinking about Waradene St Patrick of EPC (mid fawn), whom we purchased in October 2010. St Pat was our first major investment made in to a stud male, and we used him extensively in 2011. What we learned from this very quickly was; that St Pat is very good at adding colour, this included some fawn fibres in some of the whites (from white dams). Luckily these few were males and sold as non-breeding. 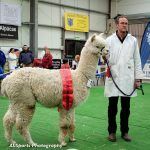 As Beck Brow Explorer (white) was by then working, he took over breeding the whites, and we focused using St Pat on our coloured females, resulting in him playing a mayor part in our success in the show ring (from fawn to black). We are now seeing his daughters producing prize winning progeny, through to championship winning blacks, and his place in our breeding programme remains secure. 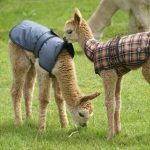 His progeny’s first fleeces are not as ultrafine, as many of those belonging to Goldmine are, but what he does have is uniformity with age. 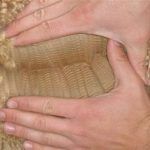 Whilst many of his progeny have first fleece stats of 18 -20 microns, where they really shine is in their second fleece, here there is little shift in micron and very good uniformity, giving the fleeces a beautifully soft handle. And what we are now seeing is that this is remaining into their third and fourth fleeces. This year St Pat will be covering Beck Brow Applause (amongst others). 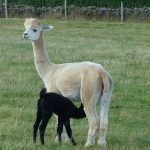 Applause is a Goldmine daughter, she is fine with great density, however her fleece does not quite have the handle nor uniformity of micron of that of her half-brother, Beck Brow Crafter (dam; Silverstream Galaxy). 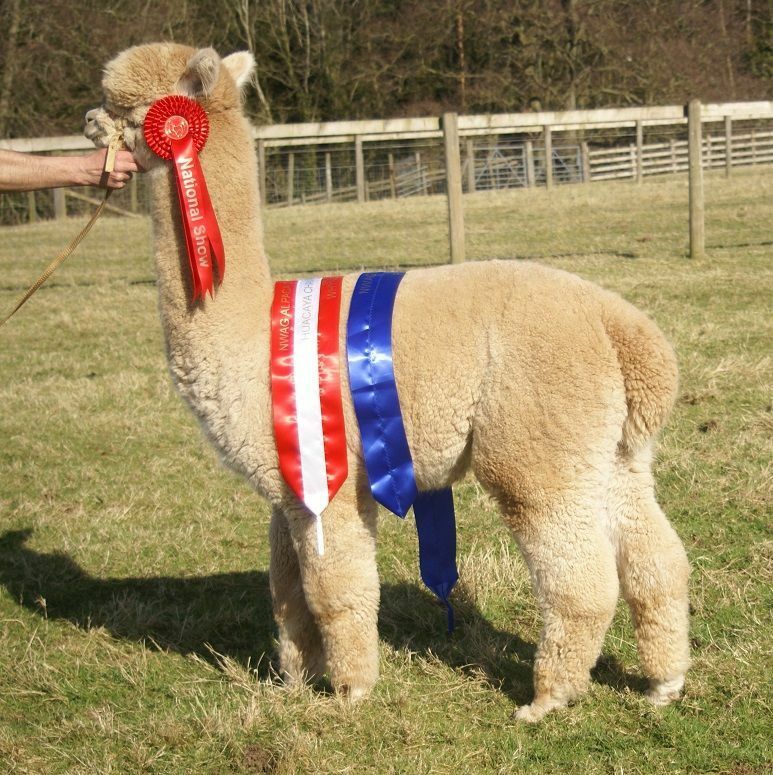 Crafter is a championship winning male owned by Fangdale Alpacas and has St Pat as his sire . With this information stored, it makes sense to make this pairing, bringing Crafter’s genetics back in, through his parents, with a good slice of Goldmine. Goldmine has provided great density and we will now hopefully add in the buttery St Pat handle. St Pat’s other great asset is that he stamps his perfectly correct frame on his progeny without fail. A very useful trait. It would have been very easy to let Goldmine and Samurai have all the fun this year, but St Patrick has proven his worth, and I will especially look forward to seeing the results of this mix of ingredients. Then we have the young guns to consider. I would like to use Beck Brow First Edition more this year. 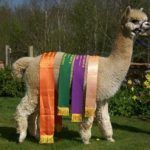 His fleece has remained fine and extremely uniform in to adulthood and with two full siblings also championship winners, this is a proven formula. Then we have the additional excitement of Beck Brow On The Money (our multi-championship winning brown male) who is now so interested in flirting with the maidens over the fence, he cannot be bothered to come in for his breakfast. 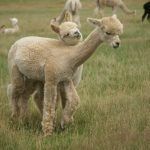 So many decisions to make; fifty six to be precise, and then another twenty eight managed alpacas to mate (that’s a bit scary now that I have written it down). The fencer has been here fencing off some more paddock space in anticipation, and no doubt Paul will be building and extending shelters. However, I think I might have to give in to releasing more females…next year! Craig is proving to be a massive help, although I think he is slightly surprised by the amount of poo shovelling involved. 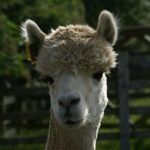 Our alpacas just love being in barns and shelters at night at this time of the year (by choice no one is locked in). Our main barn girls are the worst, they come down from the top paddock (45 of them) between 3.30 and 4pm and start on the newly filled hay racks and bags (haylage). We go out again at 10 pm and do the refills. Between 9.30 and 10 am in the morning they saunter out up the paddock…and if it rains heavily they all come back in again! That’s a lot of barrow loads of poo…but as Paul keeps reminding me… it would have to be picked up in the paddock otherwise and it’s too wet for the sweeper at present. 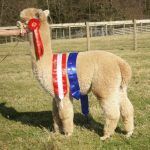 We are starting halter training tomorrow. 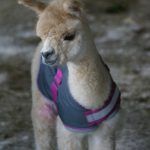 Hopefully Hip Hop (our bottle fed) will lead the way, but you never can tell…incidentally, her dam cried for her when we weaned her, after not feeding or looking after her!! 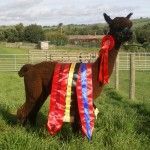 Maybe that gives us hope for her looking after this year’s cria…but we have sepia at the ready just in case.